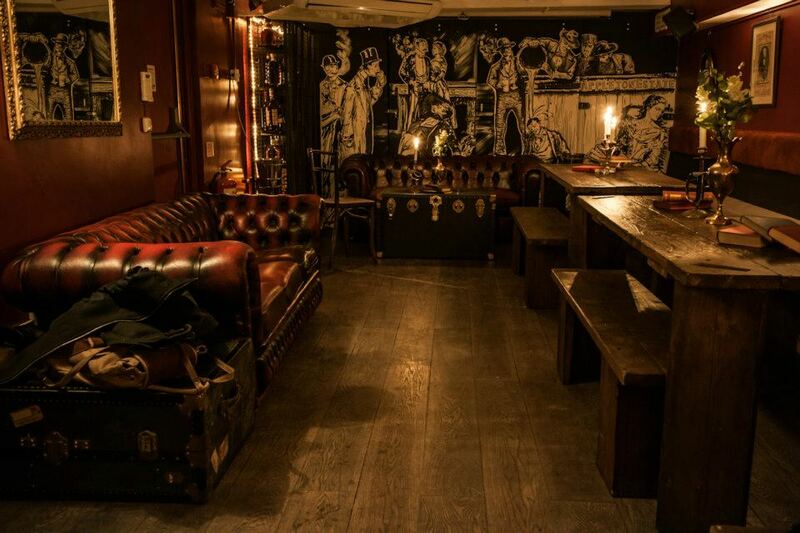 Disclaimer: This review was written for the closing weekend of PortSide Parlour’s Off Broadway venue in May 2014, PP has dropped anchor at 14 Rivington Street, Shoreditch, new review here! Entering the basement venue through the false toilet, the PP is a dark, candlelit venue with red fabric sofas lining the walls, large wooden tables and leather armchairs. Though somewhat of an open plan seating, PP can be surprisingly intimate, and comfortable in both quiet and crowded hours – successfully channelling the feel of being under-deck. 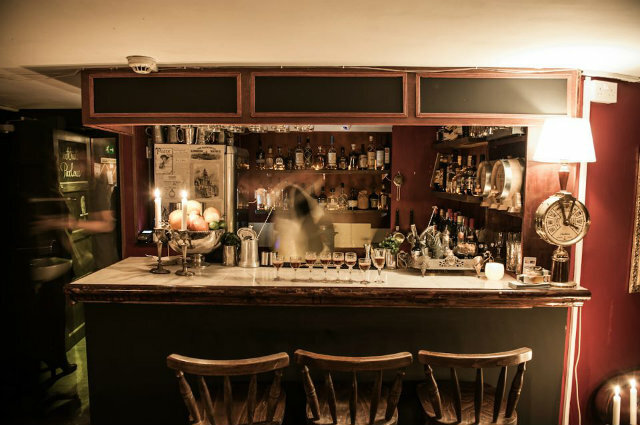 Voted the ‘Best Speakeasy in London’ according to their website, the PP also boasts an enormous selection of 50 rums, and certainly played a part in making long-neglected rum the spirit of 2014. House cocktails are primarily rum based; though also offer other, primarily dark, liquors. Three drinks were ordered, let’s get to the *non-rum* based drinks first. The Word of God is spectacular. Ambler 7yr bourbon carries Cynar and sea salt, garnished with pickles. This came with a bizarre ‘word of warning’ from the server, about it “tasting like straight bourbon” (which it didn’t). Funnily enough, the Word of God is as smooth and soft as you could imagine. The savoury Cynar complements the bourbon perfectly, with the added bite of the sea salt. Every few sips you reward yourself with a bourbon-soaked pickle. Absolutely adored this drink – flavourful, and layered wonderfully. For the rum based drinks, these were interesting. The Fishwife Punch brings El Dorado 8yr rum with lemon juice, rose syrup, Bitter Truth Apricot brandy and chocolate bitters. I normally have a bias against chocolate bitters, but these really didn’t play much of a part in the overt flavour. What we got was a long, fresh and fruity cocktail tasting primarily of the El Dorado 8yr’s toffee and apricot, with rose coming in softly in at the end. Finally, the Grace Jones is probably as out there as its namesake. Appleton Estate 8yr rum, King’s ginger liqueur, fresh lime and mint, Angostura bitters, topped up with Piper Hiedsieck Champagne. You know, it was impossible to put a finger on what was going on here. There seems to be this initial blast of mint, then somehow overwhelmingly fizzy champagne with a great ginger finish. Nonetheless, there was something about it we could put out finger on, it’s a drink we had difficulty dissecting, though overall had reminded us of… Soup? I think it might be the savouriness of the ingredients mixing with the dark sugariness of Appleton 8 yr. Not entirely sure what was going on here, but that doesn’t make it an unpleasant drink. Aromatic and, shall we say, complex? Or muddled, depending on how harsh you want to be. In the end, it’s actually kind of fun. PP’s done an excellent job with drinks so far. And although it probably isn’t anything, we were all unsettled by the ‘warning’ offered with the Word of God. This seems to be another in a long line of strange remarks made to female drinkers I’ve witnessed when ordering ‘strong drinks’ (Skylon being the worst when accusing a seasoned drinking friend of not liking a badly made Vesper because “Women don’t drink strong drinks”). Not that that is what our server at PP was insinuating, I hope. All in all, the PP was a great stop, and highly recommend it, and wish it the best in its new home on Rivington Street – of course, it will be competing with NOLA and Callooh Callay, so let’s see what the three do to up their game! Rivington Street address TBA upon re-opening. This entry was posted in Bars & Cocktails and tagged Basement, Broadway Market, Large Groups, London Fields, Rum, Small Groups, Speakeasy.